President Donald Trump sat down with two American mainstream television outlets this week after giving just two interviews to a TV outlet other than Fox News Channel in the previous five months. 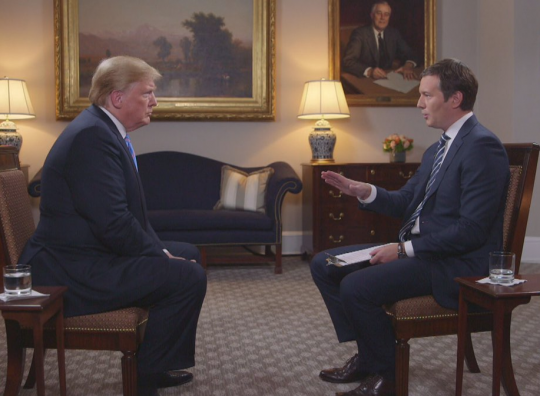 Trump granted separate interviews to CBS Evening News anchor Jeff Glor, and he also spoke with CNBC's Joe Kernen of "Squawk Box" in the span of one week, making news on his criticism of the Federal Reserve for hiking interest rates, calling the European Union a "foe" on trade, and shifting answers about Russian meddling in the 2016 election. Trump also spoke with Tucker Carlson and Sean Hannity of Fox News this week about his summit with Russia and his views on NATO. Since speaking with CNBC's "Squawk Box" on Jan. 26, Trump had only done two television interviews with an American outlet other than Fox News in that span: a June 12 sit-down with ABC's George Stephanopoulos following the summit with North Korean dictator Kim Jong Un and a June 21 interview with Mike Huckabee on TBN. According to transcripts provided by the Republican National Committee, all of his other American television interviews since late January had been with Fox. He was interviewed by Fox News and Fox Business host Maria Bartiromo on July 1, and he spoke on the White House lawn with "Fox & Friends" on June 15. Earlier that week, he spoke with Fox News host Bret Baier and Hannity in the aftermath of the North Korea summit. "Fox & Friends" host Brian Kilmeade interviewed him on May 24 about U.S. immigration laws, and Trump called into "Fox & Friends" on April 26 for 30 minutes where he expounded on topics ranging from Stormy Daniels to First Lady Melania Trump's birthday to James Comey to North Korea. On Feb. 24, he called into "Justice With Judge Jeanine," hosted by Trump supporter Jeanine Pirro. Trump has made no secret of his preference for Fox News, often blistering the rest of the media as "fake news" and even referring to the press as the "enemy" of the American people. This entry was posted in Politics and tagged CBS, CNBC, Donald Trump, Fox News, George Stephanopoulos, Media. Bookmark the permalink.